A new film called "LIGO, A Passion for Understanding," explores the science and people behind a ground-breaking instrument designed to hung for gravitational waves. A new documentary premiering today (April 15) brings the hunt for ripples in the fabric of space-time — called gravitational waves — into focus, and you can watch it live on Space.com. The Laser Interferometer Gravitational-Wave Observatory could be as significant an innovation as the telescope. This story of passionate creative researchers striving to understand the fabric of our Universe premieres Tuesday April 15 at Space.com. When two stars collide or a massive star blows up the fabric of the universe warps and springs back, sending gravitational waves across the cosmos. The wave motion would be very tiny. But to watch it, scientists must build very large instruments. 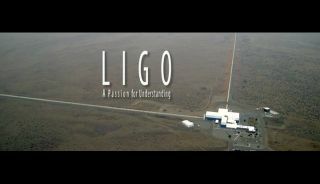 Visit Space.com Tuesday at 12 p.m. EDT (1600 GMT) to see the premiere of "LIGO, A Passion for Understanding" by filmmaker Kai Staats. Scientists might catch sight of ripples in space-time produced by two massive objects colliding in violent crashes light-years from Earth, thanks to LIGO. A new movie premiering April 15 documents the science and people behind an amazing astronomical tool designed to catch sight of violent cosmic events trillions of miles from Earth.